« I did it! I made a difference! Oh yes always grateful and happy. I understand the horrific parts, for you, Elaine, and for me. I didn’t have a choice about contact. I was just a kid. I could have turned them away, but after that kind of shock – especially the lies from my adoptive parents, I had to move through it all. And still, I’m mthe one who said to both sets of parents: I have two sets of real parents. Not my fault I was reunited with dysfunction beyond belief. Been trying to get away for over 30 years. I’m sorry you had to go through this. We who are adopted really do hear and see teh world with keen ears and eyes. Those words your Mom said, she wasn’t thinking. It won’t be clear to her. She just doens’t know. She doesn’t know how you feel. hey, won’t let me check for follow-ups! First I’d like to say I am so glad that you linked up to #WASO and also sorry it’s taken a bit of time to get here to read and comment. You must have found walking away extremely hard to do when maybe you spent so long wanting that reunion. I think it shows great strength and understanding that you are you and you have control over who you are. 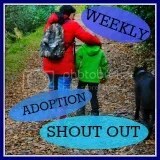 I hope we will see you on the Weekly Adoption Shout Out again, you are really welcome and, as as Mumdrah says, your voice is is also needed.